We will use the following example to understand all of the above concepts. Notice we have a table that displays a list of employees. Above the table we have 3 radio buttons. Next to each radio button we also have the count of employees. All(5) radio button has the total count of employees. Male(3) radio button has the total count of male employees and the Female(2) radio button has the total count of female employees. At the moment All(5) radio button is selected, so all the employees are displayed in the table. If I select Male(3) radio button, then only the 3 male employees should be displayed in the table. Along the same lines,if Female(2) radio button is selected only the female employees should be displayed. As we develop this example, we will understand all the following concepts. One of the component displays the list of employees. We have already built this component in our previous videos in this series. We named this component EmployeeListComponent. The other component displays the radio buttons and the count of employees. We have not created this component yet. We will create it in this video. We will call this component EmployeeCountComponent. We will nest EmployeeCountComponent in EmployeeListComponent. So EmployeeCountComponent becomes the nested component or child component and EmployeeListComponent becomes the container component or parent component. We have already implemented the required code for EmployeeListComponent in our previous videos as shown below. Now let's create the EmployeeCountComponent. Add a new TypeScript file to the employee folder. Name it employeeCount.component.ts. Copy and paste the following code. We have set select='employee-count'. We can use this selector as a directive where we want to use this component. We are going to nest this component inside EmployeeListComponent using employee-count selector as a directive. We have 3 properties (all, male and Female). At the moment we have hard coded the values. In our next video we will discuss how to pass the values for these properties from the container component i.e from the EmployeeListComponent. Add a new StyleSheet to the employee folder. Name it employeeCount.component.css. Copy and paste the following style class. Now let's add the view template for EmployeeCountComponent. Add a new HTML page to the employee folder. Name it employeeCount.component.html. Copy and paste the following html. Notice we have 3 radio buttons and bound them to the 3 properties (all, male, female) we have in the component class. We are using interpolation for data-binding. Nest EmployeeCountComponent in EmployeeListComponent component. To do this, use EmployeeCountComponent selector (employee-count) as a directive <employee-count></employee-count> on EmployeeListComponent component as shown below. Finally, declare EmployeeCountComponent in module.ts file. Please make sure you import the component first and then add it to the declarations array of @NgModule decorator. At this point, run the project and you should see employee count radio buttons and the employee list. 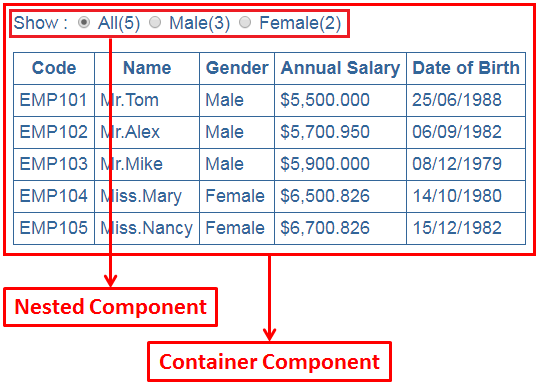 At the moment the employee counts are hard coded with in the EmployeeCountComponent. In our next video we will discuss how to pass the count values from the container component i.e from the EmployeeListComponent to the nested component i.e EmployeeCountComponent.